2026 Olympic plebiscite guide: What is it and how do you vote? Amid the ongoing debate about whether or not Calgary should host the 2026 Olympic Winter Games, city council is currently in the process of engaging Calgarians by seeking their feedback on the potential bid. As part of this process the city is hosting several information sessions. The city will be holding a plebiscite asking residents directly if they want Calgary to host the games. Unlike a referendum, a plebiscite is a direct vote by the general public on a specific issue. According to the Canadian Encyclopedia, a plebiscite or referendum is legally binding. In other words, even if the majority of Calgarians vote against hosting the games, the city council can still choose to go ahead with the bid. The plebiscite’s $2 million cost, including the hiring of 3,000 workers, is being covered by the provincial government. 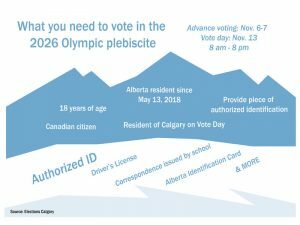 Calgary’s plebiscite will be held on Nov. 13, 2018 from 8 a.m to 8 p.m. Advanced voting will take place Nov. 6 and 7 from 11 a.m. to 7 p.m. Voting will occur in all 14 electoral wards, but voters must do so at their assigned voting station. You can find out where you can vote at calgary.ca/vote2018. Voters may also request a mail-in-ballot by phoning (403) 476-4100. They can also do so in-person at the Elections & Census Office — 1103 55 Ave NE. Accessible voting will also be held at hospitals and certain care facilities — all wards will have voting stations for care residents on the advanced voting days. What makes this vote unique is unlike last October’s election, in which more than half of the voting stations ran out of ballots, the plebiscite will include the use of electronic voting tabulators. This removes the risk of running out of ballots and according to the City of Calgary, will also improve the speed and accuracy of vote counting. Where have we seen Olympic plebiscites recently? In February 2003, the City of Vancouver held its own Olympic plebiscite with 64 per cent voting in favour of hosting the games. However, according to the Toronto Star, only 46 per cent of eligible voters did so. This past June, voters in Valais, Switzerland caused the withdrawal of their potential bid with 54 per cent voting against. Just as an election, there are a few qualifications surrounding voter eligibility. To be eligible, a voter must be 18, a Canadian citizen and have resided in Alberta since May 13, 2018. Post-secondary students outside of Calgary are also eligible to vote provided they are currently renting accommodation in order to attend a educational institution. The student must have at least one family member residing in Alberta who they normally reside with while not attending school. What will you need to vote? Voters must also provide at least one form of authorized identification, which include: Government issued identification; government-issued documents (such as government cheque or cheque stub); income/property tax assessment notice; or a statement of government benefits. Other authorized documents include things that have a proof of address — bank statements, insurance policies, a lease or mortgage statement and utility bills. Voters do not need to register in advance as voting registration forms will be available at all voting stations. Provide your feedback and find more information about Calgary’s potential bid at: engage.calgary.ca/2026games. Editors note: In a previously published version of this story in our October 25, 2018 print edition, the first sentence under the subhead “What is a plebiscite?” read: “Like a referendum, a plebiscite is a direct vote by the general public on a specific issue.” We have updated this to read “Unlike a referendum…” We apologize for the error.